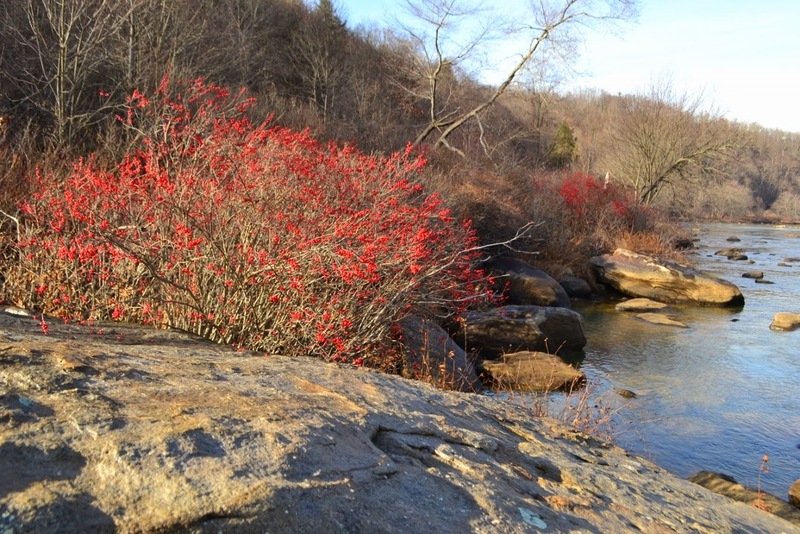 I wasn't expecting to find anything incredible when I was drawn to the riverbank by the brilliant red berries of these Winterberry bushes. As I was there taking photos, I made a fascinating discovery on the big rock pictured here in the foreground. I thought at first the mud in the rock's cavities had been packed in by flood waters, but then I saw an exit hole in one of the mud-filled crevices and quickly investigated further. Truly, the exit hole gave it away. As soon as as I saw this exit hole in the mud wall plastered over the small cavity in the rock, my mind flashed back to last summer when I saw a small black wasp with some yellow bands (a mason wasp) that was working diligently at excavating the dirt from a cavity in a rock. After the wasp left, I had examined what little progress the mason wasp had made and actually decided the wasp was hopelessly wasting its time. 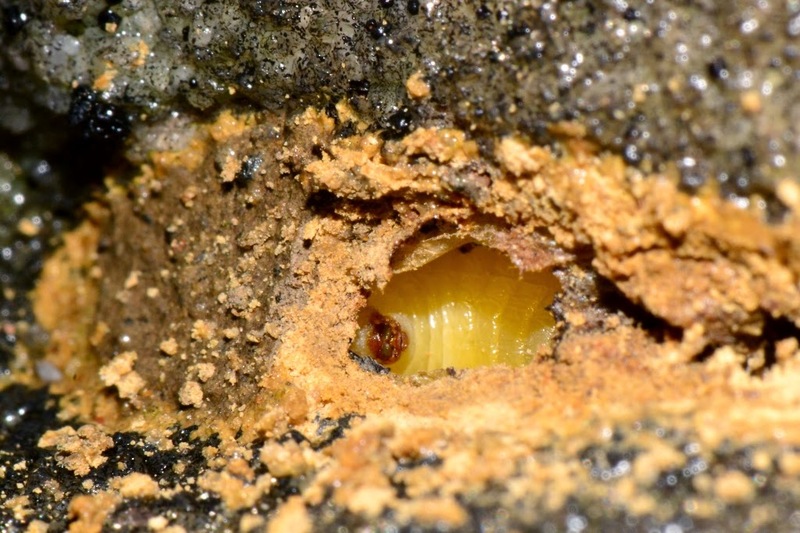 At the time I had concluded there was no way the wasp could excavate any kind of tunnel into the rock and the preexisting cavity, in my mind, would be too small for the wasp's nest. Well, I realized that was a wrong conclusion when I saw these mud nests on the boulder under the winterberry bushes. 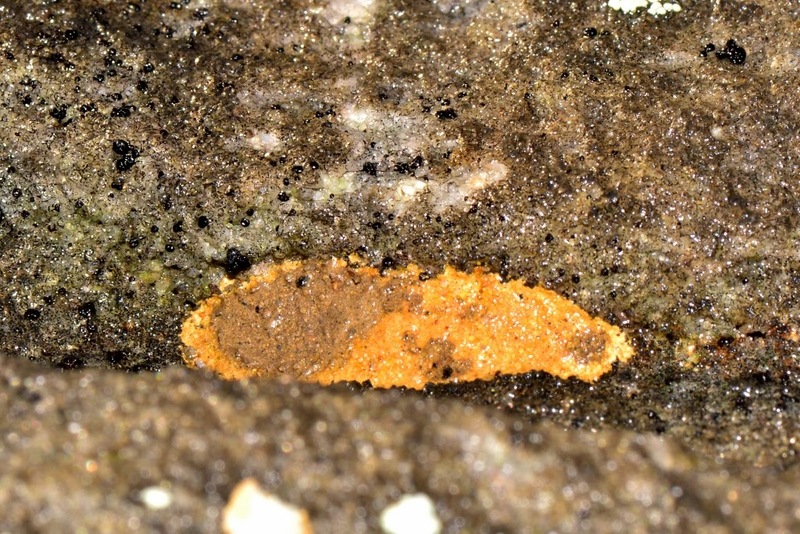 Here is a close-up photo of one of the mason wasp nests showing the mud plastered over a cavity in the boulder. The rock and the mud are wet because it had just rained. I took a small twig and carefully pried away some of the mud wall to expose the larva inside the mason wasp's nest. 1. 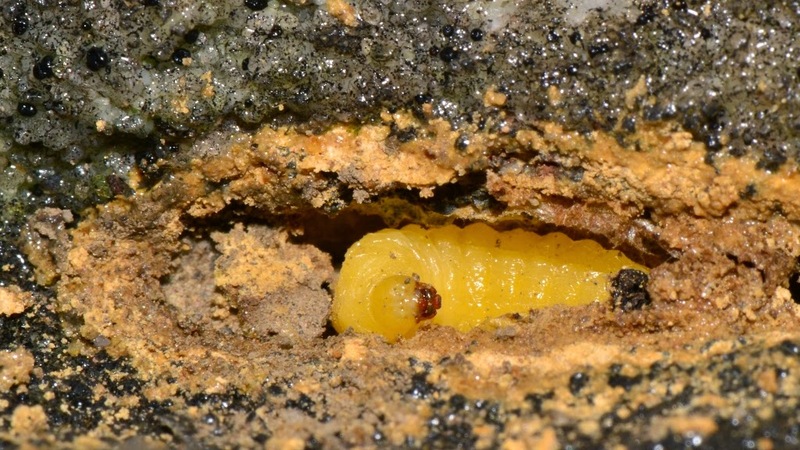 The mason wasp larva nearly fills the shallow cavity behind the mud wall. 2. There is a silk lining, or cocoon, evident behind the mud wall. 3. Only the surface of the mud wall of the mason wasp's nest is wet from the rain. The thin wall of mud must be somehow waterproofed. Here is the mason wasp's nest with more of the plaster seal removed to expose the overwintering larva. 1. 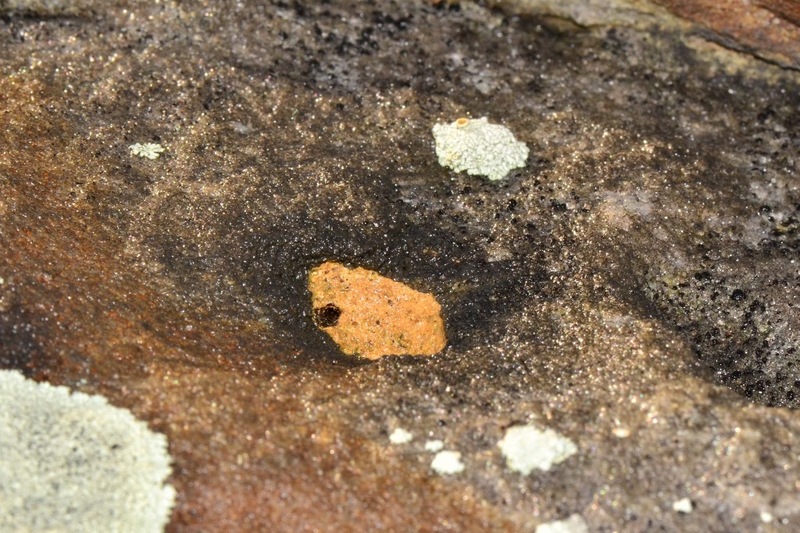 The silk lining is contoured to the ridges along the larva's body (try zooming in on the photo). 2. The cavity must have had little room for whatever food-stores were provisioned for the mason wasp larva. 3. The plump little wasp larva was spending the winter in a dark, cold place until I carefully removed it to try to rear it to adulthood. My regular readers know that now I will have to go back to that rock in the summertime and watch the mason wasps filling those cavities with food stocks for their larvae. You can bet that I also have to attempt to observe the wasps walling in their eggs along with whatever provisions they have placed in those tiny grottoes. As always I learned something new Dana. Fascinating. Since the river-side rocks must be completely covered with flowing water at times, occasionally for extended periods, the mud must be able to withstand that. 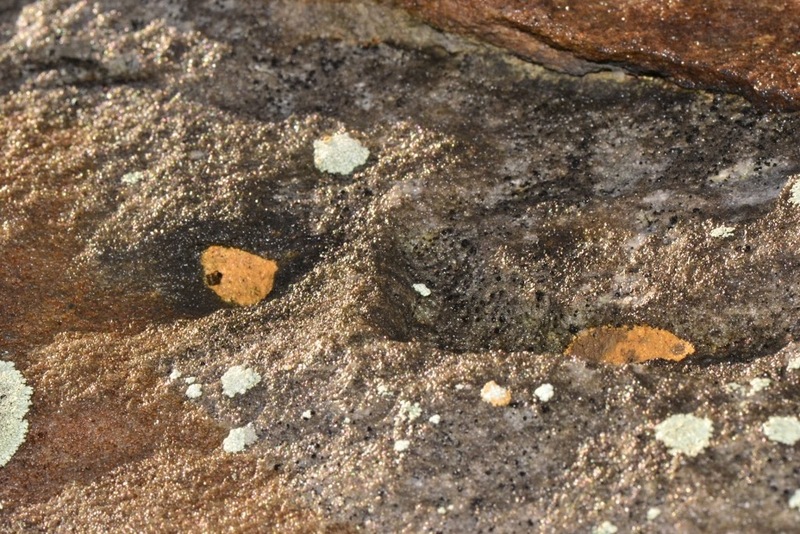 Or perhaps the wasps also build in rocks away from water if the site is otherwise suitable. Interesting. Since these nest in the riverside rocks must occasionally be under water for extended periods in the spring it makes me wonder how waterproof the mud is or if they also build in rocks further from the water thus insuring reproductive success. I wonder too... I had to wonder if the nests could survive flood waters or ice scouring. I'll keep checking on these nest when I get a chance.